How does art fit into the history of cinema? This question forms the unifying thread that binds a group show currently on view at the Swiss Institute. In “Fade In: Int. 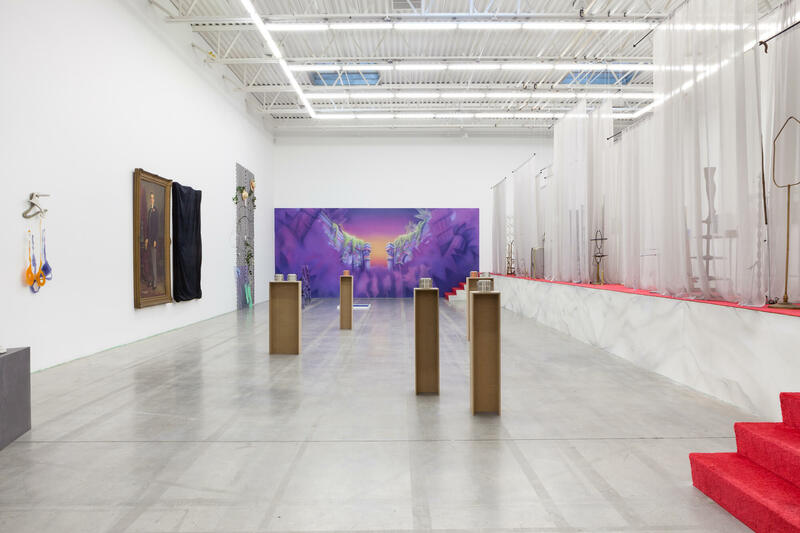 Art Gallery – Day,” which is up through May 8, 25 artists, including Jamian Juliano-Villani, Nairy Baghramian, Heman Chong, and GALA Committee, along with heavyweights like Cindy Sherman, Christian Marclay, and William Leavitt, offer their responses to films which use art objects to drive the plot. In Sherman’s response, for instance, she elected to engage with the 1945 American film adaptation of The Picture of Dorian Gray—an Oscar Wilde-penned tale that elevated painting to magical heights by giving a canvas the ability to absorb the aging process. Sherman has paired the original painting created by Henrique Medina for the film with what the gallery’s text refers to as a “hidden painting,” which she has wrapped in black velvet, and named The Evil Twin. On an interesting note that conveys that Sherman is not the only one who was intrigued by this portrait, Medina’s painting was sold last May at auction at Christie’s for $149,000, according to the artnet Price Database. It had an estimate of only $5,000 – $8,000 and is now the artist’s record at auction. Other artists on view committed to less mischievous approaches. Take Leavitt, for instance. The Los Angeles-based artist spent his early days crafting sets and props for various Hollywood studio productions. In a nod to this experience, Leavitt created a mock-up set for The Tropics, a script he wrote in the 1970s for a film that never got produced. You can see his faux set at the entrance to the show. At its core, what the exhibition offers is a unique window into art’s role in the world of popular film.